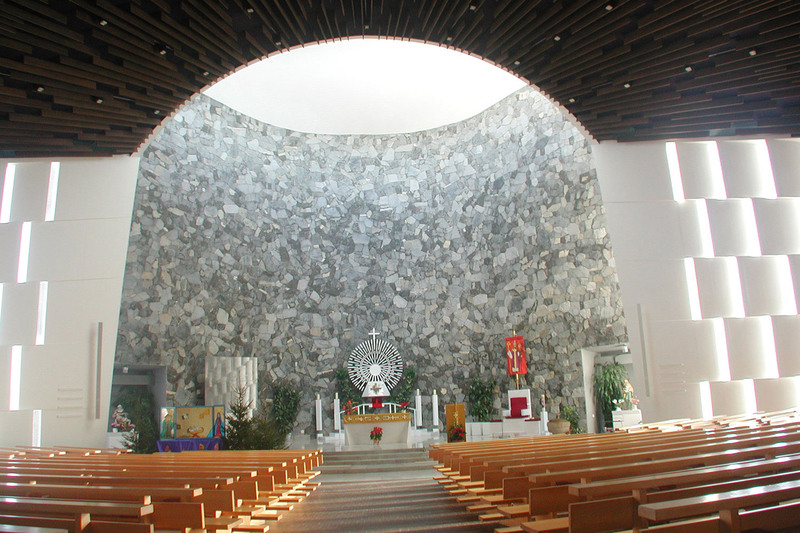 The Catholic Church in Le Noirmont – a beautiful, large fan-shaped concrete building – has suffered from low speech intelligibility since its initial construction in 1969. The problems caused by highly excessive reverberation have finally been addressed by a fully integrated architectural and electro-acoustic solution that is almost invisible to the eye, which results in a dramatic optimization of the room’s acoustical characteristics. 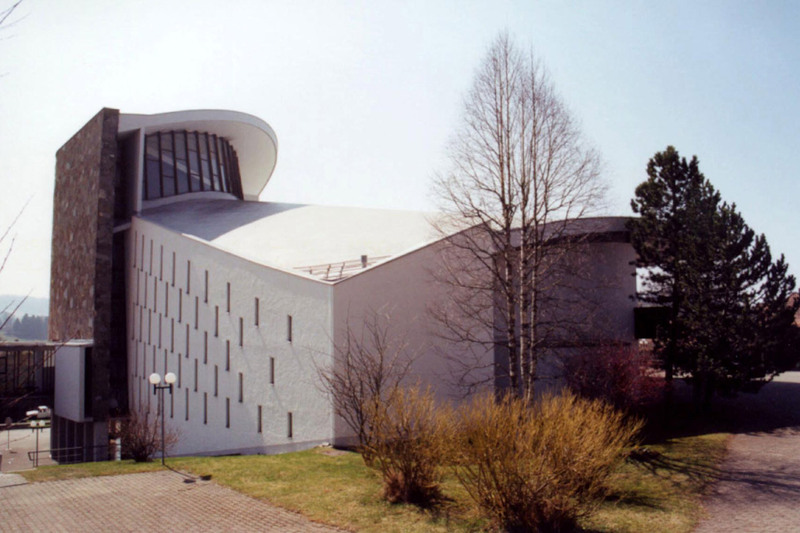 This project is a collaboration project of Walters-Storyk Design Group Europe (WSDG-e) GmbH, Swiss Audio Consultant David Norman, Telemontagne SaignelÈgier AG (Claude Schaffter) and Architect Pierre Ruch. 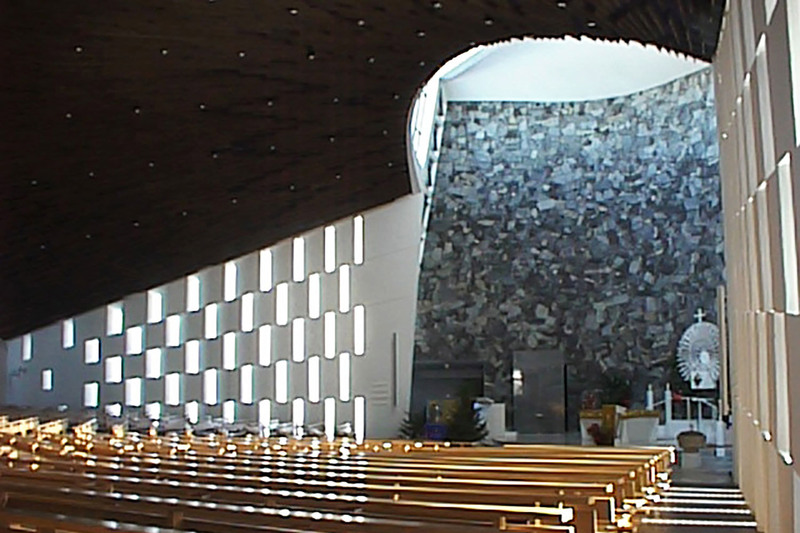 The fan-shaped floor-plan, with an impressive natural-stone tower and the ingenious window pattern at the side walls, offers wonderful viewing angles towards the front and back of the church that become even more fascinating when direct sunlight hits the building. A balcony level carries the organ and additional seating / choir space. 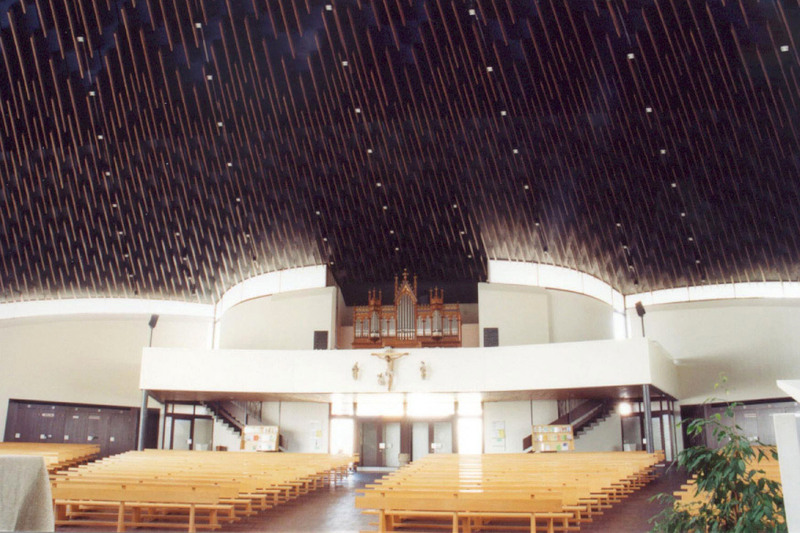 Vertically mounted wood paneling at the ceiling and the total church layout direct the attention towards the up-and-forward direction to represent the religious character of the space. 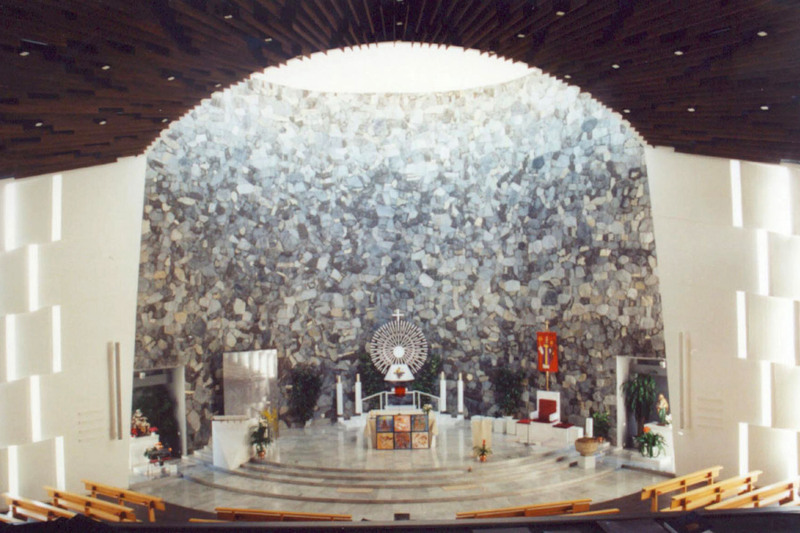 The main goal of the church remodeling was to improve the room acoustics (i.e. speech intelligibility). 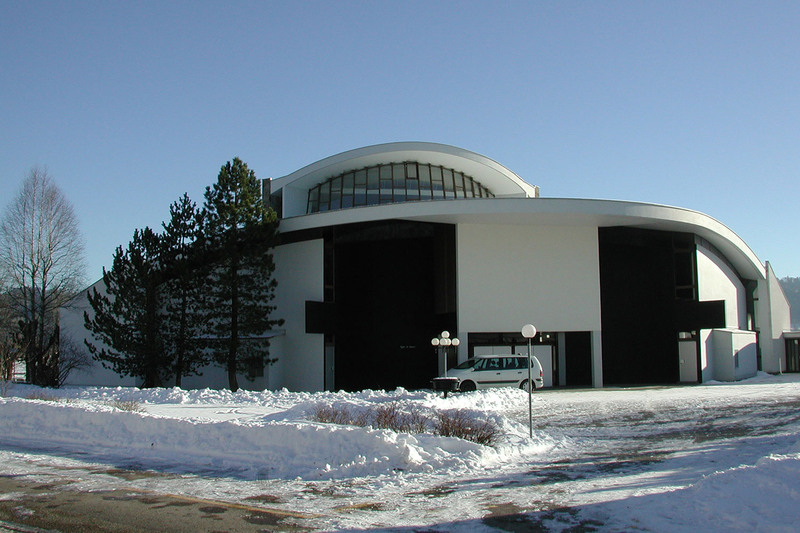 Acoustical measurements were performed to obtain an understanding of the acoustic and intelligibility characteristics of the existing worship space. Results were shocking. 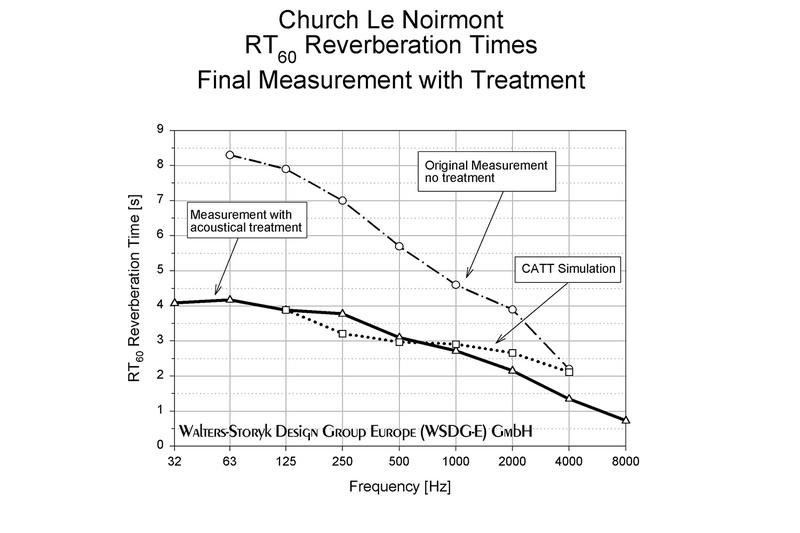 Reverberation Times of over 8 seconds were present at low frequencies! Slightly lower (but still excessive) values were measured at mid and high frequencies. Goal curves for the given room volume call for Average Reverberation Times of around 3.0 to 4.0 seconds. Upon completion of the initial acoustic measurements, it was determined that advanced acoustic modeling and analysis would be required. 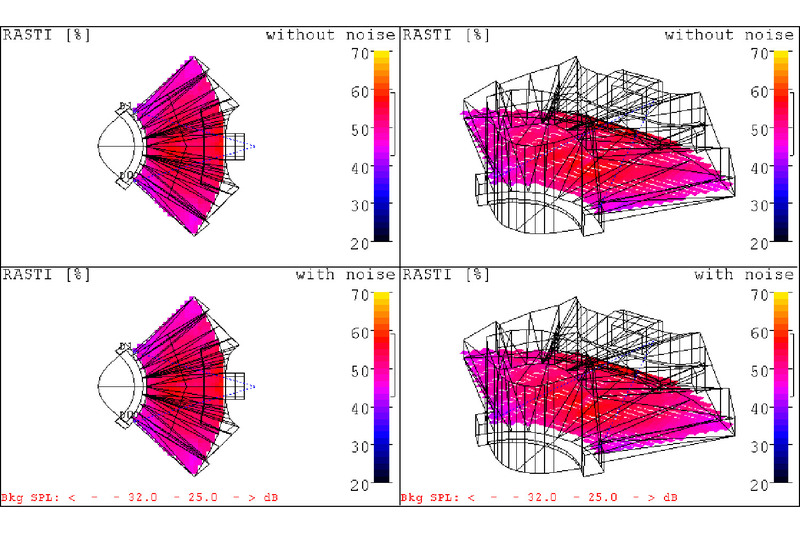 This was accomplished using one of the most powerful acoustical analysis and simulation software packages available, CATT Acoustic. 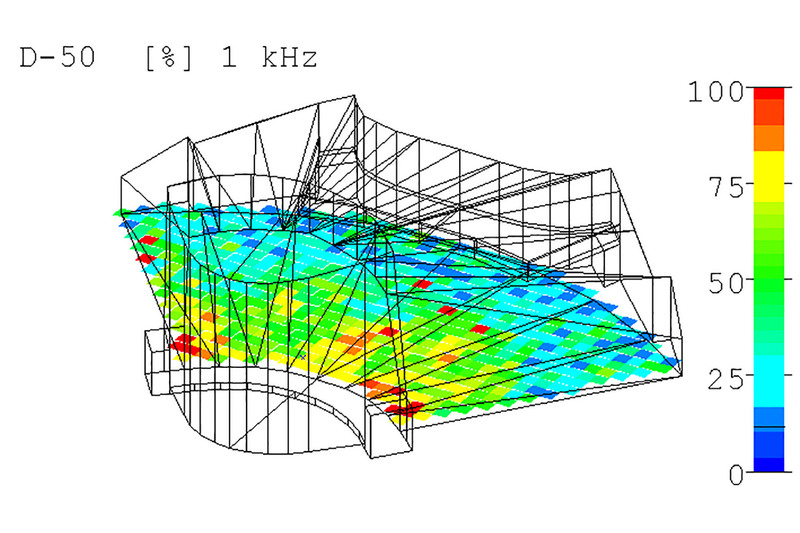 This software package allows full modeling of all acoustical parameters in an architectural space, including auralization, which means that an instrument, a human speaker or a recording can be virtually replayed in the CAD simulated space. An evaluation of the acoustical quality is then possible by listening into the simulated room with a pair of headphones. 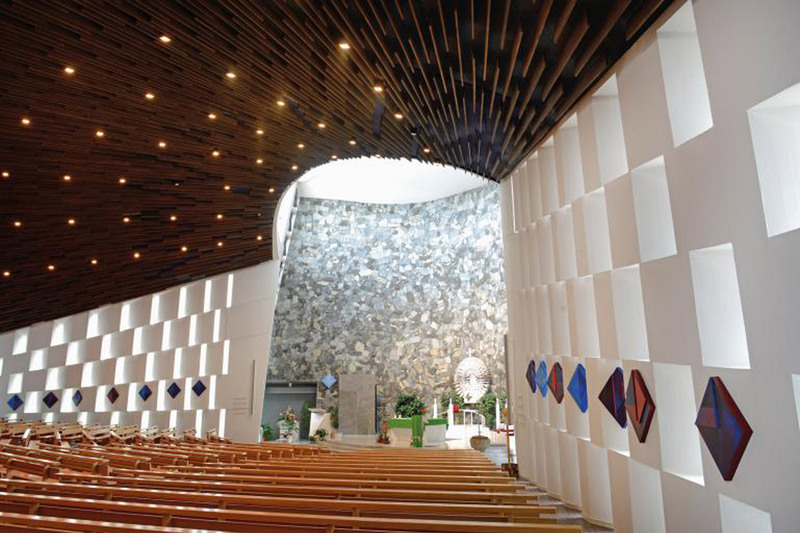 Using CATT Acoustic, a treatment solution for the church space was developed, tested and optimized to its fullest extent. A crosscheck with traditional calculation techniques using the classic Sabine and Eyring RT60 equations and with our experience gave the final “okay” to further explore the required construction techniques and modifications. Communication with the Building Conservation Department from early on in the project was helpful in finding a solution that did not obstruct the optical qualities of the beautiful church architecture. The side window walls were not to be touched. Acoustically, this was acceptable, for only few sound rays would have hit these walls during a typical sermon speech configuration. Absorption of mid and high frequency early reflections by means of porous absorbers to be located close to the source, which in this case is the ceiling. 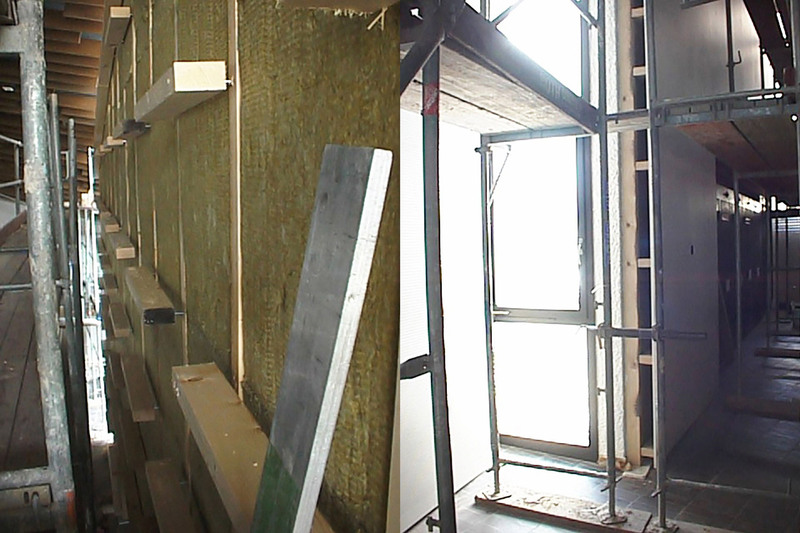 The absorber material has been covered by fabric in the same color as the underlying, existing ceiling. The newly covered area of about 120 m2 (approx. 1300 sq. ft) is practically invisible. 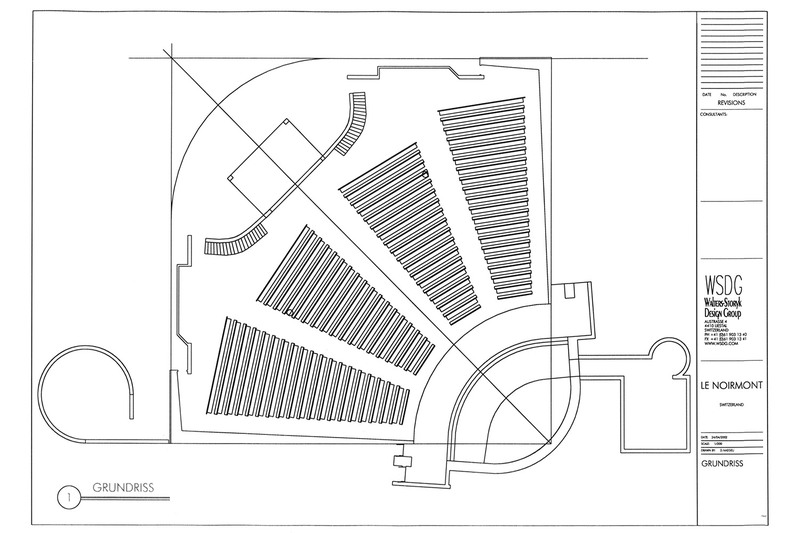 Absorption of the diffuse sound field at low, mid and high frequencies by means of custom designed Helmholtz resonators / absorbers to be mounted at the entire rear wall (behind the audience) and at the balcony front. These Helmholtz resonators have been fabricated from white microperforated sheets of wood, mounted on a grid at a precisely calculated distance from the wall. The effectiveness of these measures has been excessively tested in CATT Acoustic prior to final ordering and construction. Some of the dozens of simulated result graphs are shown below. Auralizations were performed to obtain sound files that represent the remodeled acoustical condition for voice, organ, acoustical instruments and other sources. The results were presented and agreed to by the client. The physical construction and installation of the acoustical elements were started, a process that would take up most of the summer vacation period during 2001. The ceiling in the front part of the church, above the altar position. The rear wall, consisting of two sections left and right of the main entrance and one section in the top center, left and right from the organ location. 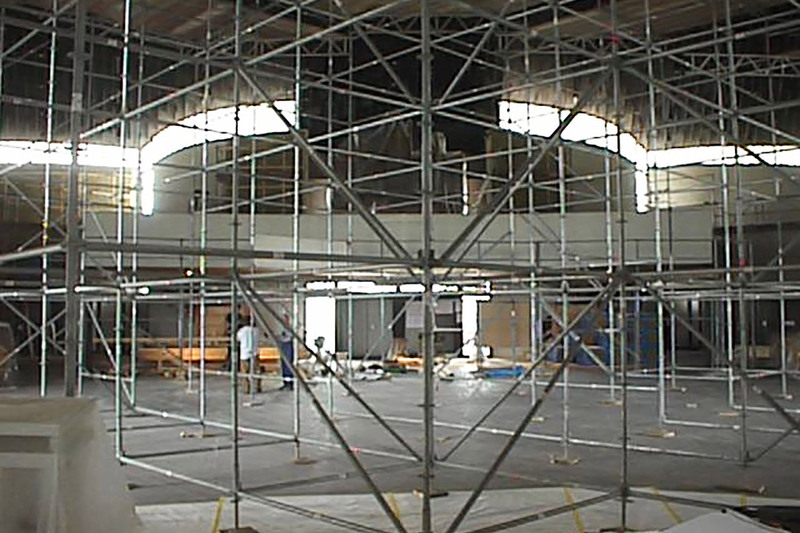 The ceiling and back wall construction areas required a huge scaffolding system covering almost the entire church floor. 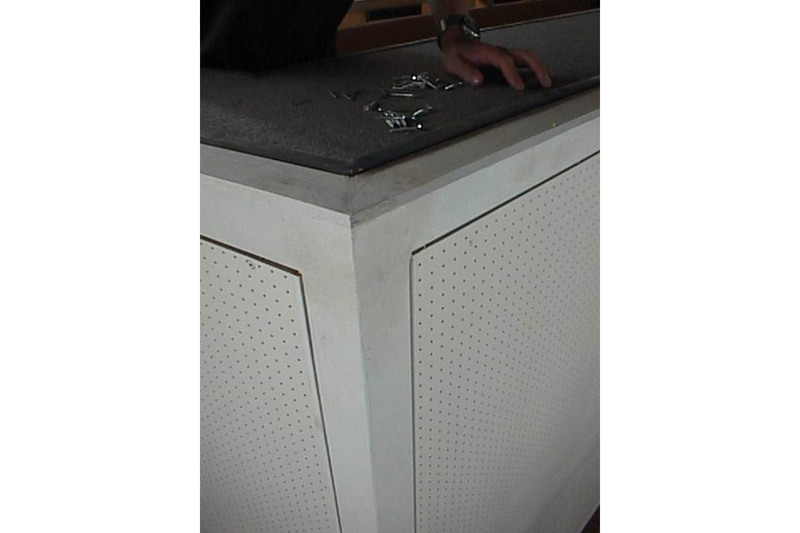 Besides optimization of the room acoustical parameters, the electroacoustical system was replaced as well. 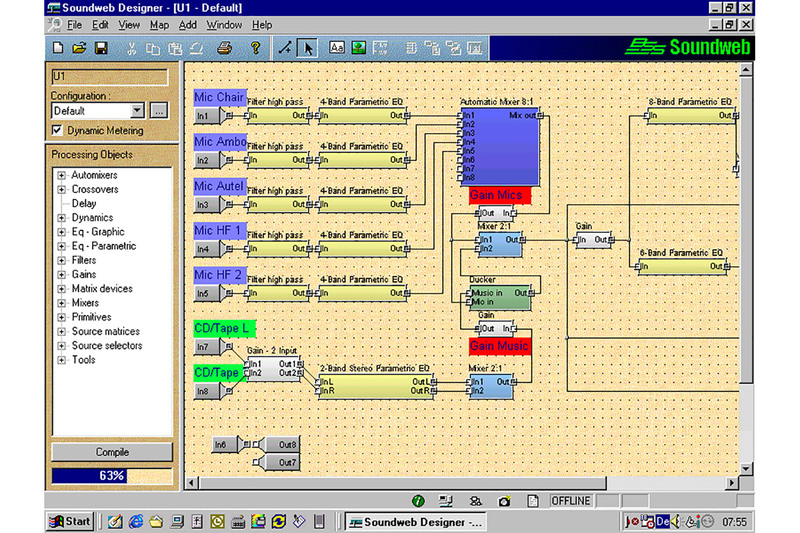 sing the same modeling software (CATT Acoustic), ectroacoustical sources (e.g. loudspeakers) were chosen and placed in the virtual room. 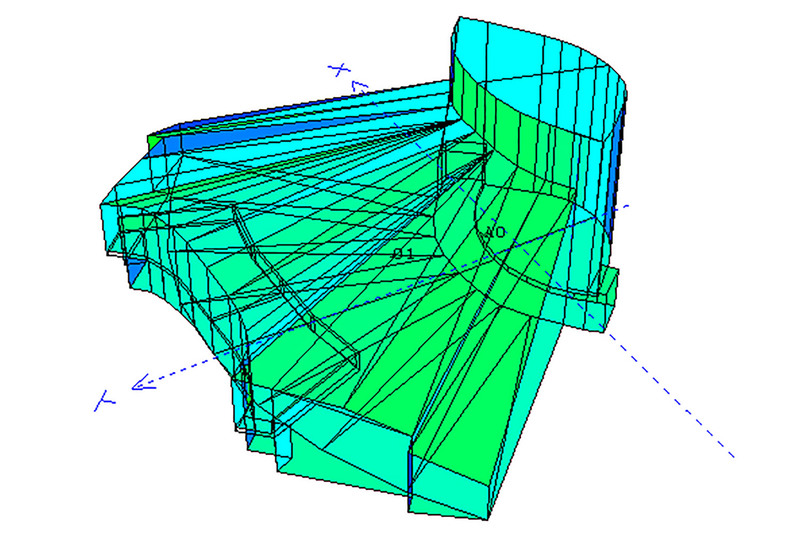 Further modeling steps resulted in the specification of the proper loudspeaker / controller system. In this case two Duran Audio Intellivox 2B loudspeakers were chosen, controlled by a BSS Soundweb Digital Processor with Remote Controlled Volume Control. Microphone selection included Sennheiser Evolution Wireless Systems and AKG Gooseneck Fittings. A remote controlled media replay and recording system (CD, Compact Cassette) was implemented as well. The RT60 measurement results (measured with the same (Intellivox-independent!) 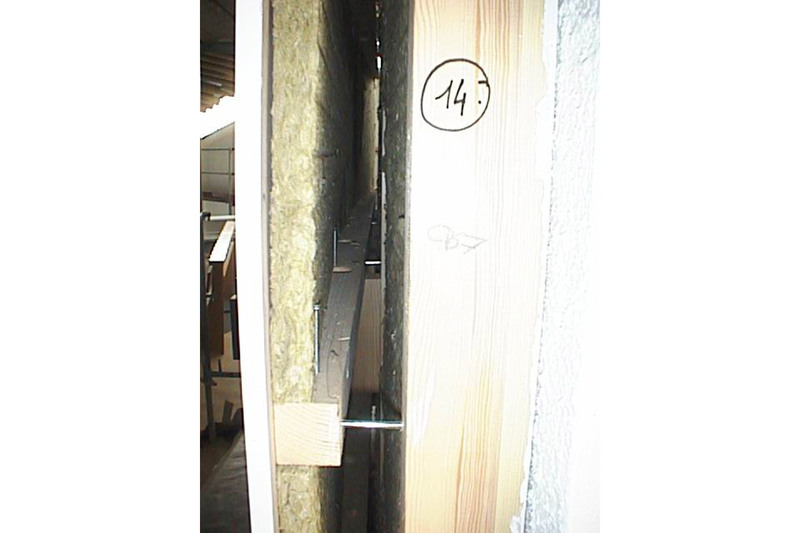 system as used for the initial measurements) of the finished room were within a few percentage points of the simulated values, which are obviously in line with the recommended Reverberation Time characteristics for a church room of the given volume. In line with the RT60 measurement results, the measured STI Speech Intelligibility values using the loudspeaker system ranged from 0.5 to 0.7, also within a few percentage points of the simulated values as well. ALCons (Articulation Loss of Consonants) reached values from 7% to 3%, which basically allows flawless communication and which means an improvement factor of up to 4. Besides the measurement results, subjective assessment of the room has been very encouraging as well. 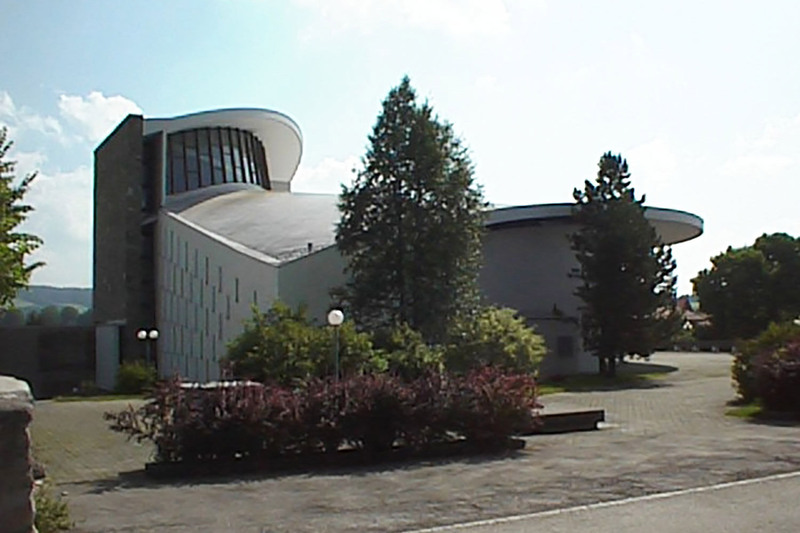 Since the implementation of the new room acoustics the church community has successfully started to use the church as a performance venue for classical and brass-band style concerts. The broad frequency range over which the acoustical optimizations were designed for have resulted in a highly favorable acoustical environment and one with high speech intelligibility values. The final result is a very happy client in a beautiful, aesthetically practically untouched church, which now has a wider range of usage, a clearer understanding of the religious service, and (at last) acoustics that suit the choir and organ.